I LOVE Hot Fudge Cakes! It’s basically like a brownie with warm, gooey hot fudge oozing out of it. It’s a delicious mess. Zack shares my love for them, so I decided to give making one a try. When it is still in the pan, it looks like regular brownies. Then you cut into it and realize the whole underneath part is hot fudge. I put a scoop of ice cream on top of Zack’s as you can see above, but I just ate mine place (thanks, lactose intolerance!). Seriously, though, it was AMAZING plain. It says nine servings, but good luck getting 9 servings out of it! I think Zack and I ate the whole thing in about 2 days. Oink. Prep: 20 minutes. Bake 40 minutes. Cool 10 minutes. 9 servings. 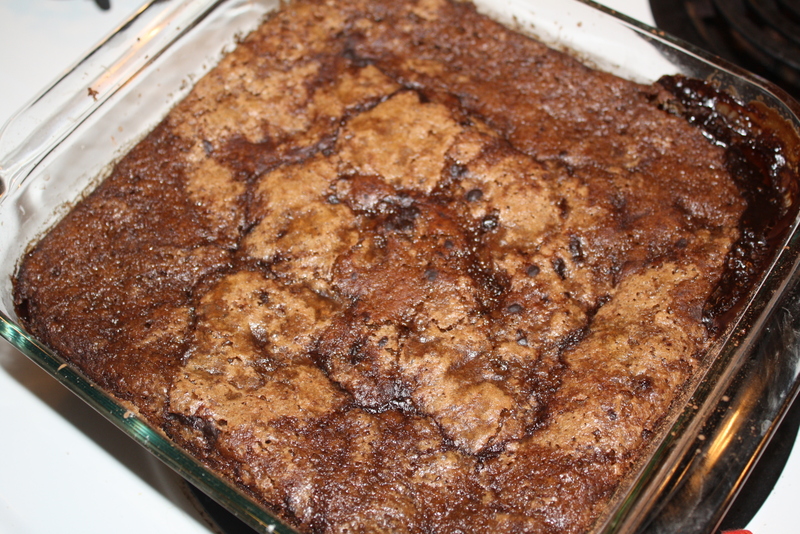 Mix flour, granulated sugar, 2 T cocoa, the baking powder, and salt in ungreased square pan 8x8x2 inches. Mix in milk, oil, and vanilla with fork until smooth. Stir in nuts. Spread in pan. Sprinkle brown sugar and 1/4 c cocoa over batter. Pour water evenly over batter. Bake at 40 minutes or until top is dry. Cool 10 minutes. Great looking cake…even better with ice cream and hot fudge. This is my kind of dessert. YES this is my kind of dessert! 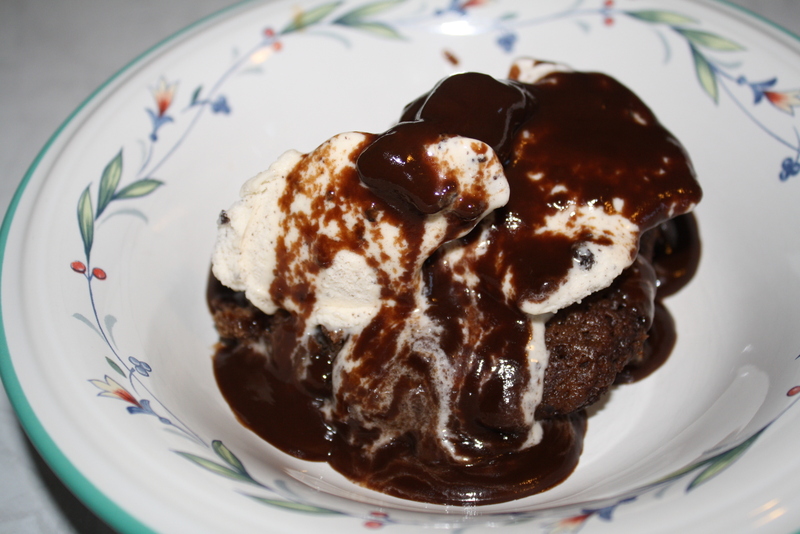 Warm chocolate ooey gooey goodness with ice cream and hot fudge, sign me up! Oh my goodness this sounds like heavenly deliciousness!! This would be fantastic with a nice heaping scoop of ice cream! Speaking of which, since you’re lactose intollerant (like me) have you ever tried the Lactaid Vanilla Bean Ice Cream? It’s pretty amazing, my boyfriend, who isn’t lactose intollerant actually ate most of the carton but from what I was able to get out of his death clutch was delicious. You should try it out if you haven’t yet.